Sequence diagram is an interaction diagram that shows the objects participating in a particular interaction and the messages they exchange arranged in a time sequence. Use a sequence diagram to show the actors or objects participating in an interaction and the events they generate arranged in a time sequence. In Edraw Professional, the UML Sequence Diagrams templates and shapes are in the Software folder. The following template describes the basic drawing elements used in UML sequence diagrams and when they are used. These are the diagram elements that are supported by the Edraw Sequence Diagram Editor tool. Some are not part of the UML specification and may not be supported by other UML tools. Edraw is an optimal software to draw UML sequence diagrams. UML sequence diagrams are used to represent or model the flow of messages, events and actions between the objects or components of a system. Time is represented in the vertical direction showing the sequence of interactions of the header elements, which are displayed horizontally at the top of the diagram. Sequence Diagrams are used primarily to design, document and validate the architecture, interfaces and logic of the system by describing the sequence of actions that need to be performed to complete a task or scenario. UML sequence diagrams are useful design tools because they provide a dynamic view of the system behavior which can be difficult to extract from static diagrams or specifications. Although UML sequence diagrams are typically used to describe object-oriented software systems, they are also extremely useful as system engineering tools to design system architectures, in business process engineering as process flow diagrams, as message sequence charts and call flows for telecom/wireless system design, and for protocol stack design and analysis. Complex interactions between components. Sequence diagrams are often used to design the interactions between components of a system that need to work together to accomplish a task. They are particularly useful when the components are being developed in parallel by different teams (typical in wireless and telephony systems) because they support the design of robust interfaces that cover multiple scenarios and special cases. Use case elaboration. Usage scenarios describe a way the system may be used by its actors. The UML sequence diagram can be used to flesh out the details of one or more use cases by illustrating visually how the system will behave in a particular scenario. The use cases along with their corresponding sequence diagrams describe the expected behavior of the system and form a strong foundation for the development of system architectures with robust interfaces. Distributed & web-based systems. When a system consists of distributed components (such as a client communicating with one or more servers over the Internet), sequence diagrams can be used to document and validate the architecture, interfaces and logic of each of these components for a set of usage scenarios. Complex logic. UML sequence diagrams are often used to model the logic of a complex feature by showing the interactions between the various objects that collaborate to implement each scenario. Modeling multiple scenarios showing different aspects of the feature helps developers take into account special cases during implementation. State machines. Telecom, wireless and embedded systems make extensive use of state machine based designs where one or more state machines communicate with each other and with external entities to perform their work. For example, each task in the protocol stack of a cellular phone goes through a series of states to perform actions such as setup a call or register with a new base station. Similarly the call processing components of a Mobile Switching Center use state machines to control the registration and transfer of calls to roaming subscribers. Sequence diagrams (or call flows as they are commonly referred to in the telecom and wireless industry) are useful for these types of applications because they can visually depict the messages being exchanged between the components and their associated state transitions. These are some of the main benefits of using UML sequence diagrams. 1. Help you discover architectural, interface and logic problems early. Because they allow you to flesh out details before having to implement anything, sequence diagrams are useful tools to find architectural, interface and logic problems early on in the design process. You can validate your architecture, interfaces, state machine and logic by seeing how the system architecture would handle different basic scenarios and special cases. This is particularly true for systems involving the interaction of components that are being implemented in parallel by different teams. In the cell phone example, each task would typically be implemented by a separate team. Having a set of sequence diagrams describing how the interfaces are actually used and what messages/actions are expected at different times gives each team a consistent and robust implementation plan. You can also document how special cases should be handled across the entire system. The very act of creating the sequence diagrams and making them work with your architecture is valuable because it forces you to think about details such as interfaces, states, message order, assignment of responsibilities, timers/timeouts and special/error cases ahead of time. 2. Documentation. 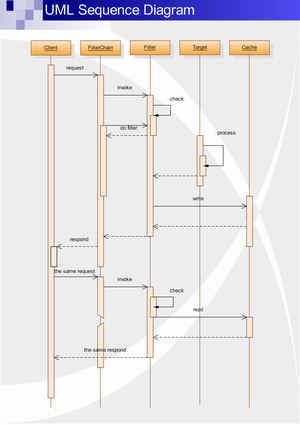 Sequence diagrams can be used to document the dynamic view of the system design at various levels of abstraction, which is often difficult to extract from static diagrams or even the complete source code. The diagrams can abstract much of the implementation detail and provide a high level view of system behavior. 3. Collaboration tool. Sequence diagrams are valuable collaboration tools during design meetings because they allow you to discuss the design in concrete terms. You can see the interactions between entities, various proposed state transitions and alternate courses/special cases on paper as you discuss the design. In our experience, having a concrete design proposal during design meetings greatly enhances the productivity of these meetings even if the proposed design has problems. You can narrow down the problems and then make corrections to solve them. The proposal serves as a concrete starting point for the discussion and as a place to capture proposed changes. Sequence diagram editor makes it so easy to edit your sequence diagrams that you could even make the corrections in real time during the meeting and instantly see the result of the changes as you make them.